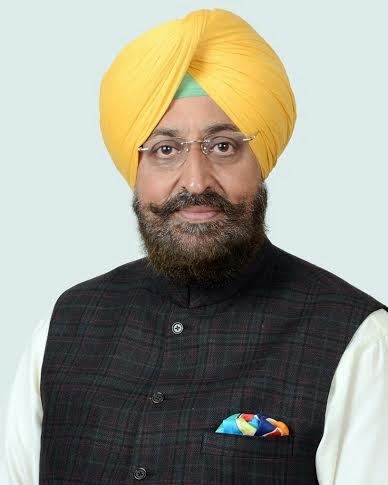 Chandigarh: The Punjab Pradesh Congress Committee President, Mr. Partap Singh Bajwa, today challenged the Bharatiya Janata Party ministers in the state to have courage to admit the fact that it was the Deputy Chief Minister, Mr. Sukhbir Singh Badal, who was dictating their departments and they were merely figure heads. He also termed the Akali Dal-BJP alliance as opportunistic and not a union of hearts, the underlying factor of which was the historical fear psychosis of destabilisation in the mind of the Chief Minister, Mr. Parkah Singh Badal. In a statement issued here today, Mr. Bajwa said it was interesting that the Akali Dal had blamed the alliance partner for the back breaking burden of property tax and illegal sand mining on the logic that both these departments were with the BJP. “Can the Local Bodies and the Industries ministers have courage to admit the fact that it is Mr. Sukhbir Singh Badal who is running their departments and dictating the policies? The industrial policy was announced by the Deputy Chief Minister while the then Industries Minister Mr Anil Joshi was sitting in the side-lines. He had no role to play. Similarly, the Local Bodies Minister was a mute spectator when the property tax was imposed. The fact is that the BJP ministers have failed to perform any effective role in the government”, he added. In the process, the BJP ditched its own support base. Mr. Bajwa said the people had given vent to their anger against the BJP in the urban areas as the party ministers failed to stand up against the dictatorial attitude of the Deputy Chief Minister. He pointed out that the Deputy Chief Minister had no special powers and this office was not statutory and just ceremonial. The Deputy Chief Minister was like any other minister but the BJP failed to resist him. This was the reason that a stalwart like Mr Arun Jaitley faced humiliating defeat in Amritsar. He said this was the high time for the BJP to rectify this distortion. Commenting upon the Akali Dal logic that this alliance was a union of hearts and driven by amity and communal harmony, Mr Bajwa said the real basis of this alliance was the fact that Mr Badal had always suffered from the fear psychosis of destabilisation of his government till the Akali Dal turned unipolar. This was so when he became the chief minister for the second time in 1977. His leadership was challenged by both the then party President, Mr. Jagdev Singh Talwandi, and the then Shiromani Gurdwara Parbandhak Committee chief, Jathedar Gurcharan Singh Tohra. He had learnt this bitter lesson that he could depend upon the BJP for survival in case of any challenge from other Akali leaders. It was a different matter that there was now no challenge to his leadership. He said apart from this, the Akali Dal had realised that it had little support base in the urban areas and it was this situation that was another factor contributing to the alliance. He said none knew it better that the senior party leader, Mr. Balramji Dass Tandon who had the courage to point out the reasons for the humiliating defeat of the Akali Dal-BJP combine despite the Narendra Modi wave in other parts of the country. He said it was a matter of record that the BJP had been the most vociferous opponent of the Akali Dal over the years on almost every issue dear to the Akalis in the past. Punjab Congress General Secretary Rajanbir Singh today said the family of Chief Minister Parkash Singh Badal had refused to learn any lesson from the drubbings in the recent Lok Sabha elections in which the people gave vent to their revulsion against this family, especially in Bathinda, if the induction of Harsimrat Kaur Badal in the cabinet at the centre was any indication. In a statement issued here, he said both Badal and his son Deputy Chief Minister Sukhbir Singh Badal, lobbied hard with Narendra Modi for the induction of Harsimrat overlooking senior leaders like Ranjit Singh Brahmpura and Prem Singh Chandumajra. He said Sukhbir’s wife Harsimrat had just managed to scrape through the election despite the entire state machinery having been at her command during her last term. However, the people had expressed their anger against the family. He accused Badal Senior of nepotism and promotion of his immediate family over senior party leaders with decades of service and sacrifice for the party which had parallels only in autocracies and dictatorships. He said perhaps no other political family in the country had such greed of office as the Badals. Commenting that Badal was treating Punjab as his family fiefdom, he said the Chief Minister and his son had discarded all principals of this eighty year old party nurtured with great sacrifices by the workers during various agitations and turned it into a private limited firm. He said the message from this was clear that only family mattered and hardworking people with history of sacrifices, dignity and self-respect had no place in the party. Terming Badal as the modern day ‘Dhritrashatra’ who, blinded by the love of his progeny, was ready to sacrifice others like Jail minister Sarwan Singh Phillaur and not remove allegedly the most corrupt minister like Bikram Singh Majitha accused of being the king pin of drug trade in Punjab as he was brother-in-law of his son. He said like in the Lok Sabha election, the people in Punjab would once again give a befitting reply to such atrocities and disregard on the state by the ruling family.